a, The torch item (BURNING_TORCH_ITEM). Place it so Lara can pick it up. In this case it won't get into inventory: Lara will hold it in the left hand and you can get rid of it if Lara throws it (by key 'drawing a weapon', i.e. SPACE) or drops it (by drawing a weapon with shortcut keys 1, 2 etc. or choosing a weapon from inventory). b, The TORCH_ANIM object: it contains Lara's 'left hand with the torch' mesh and some animations to use the torch. 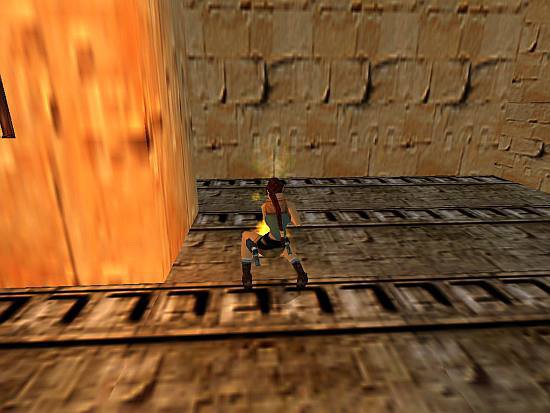 c, The animations 427, 428, 429, 430 and 431 of LARA object to use the torch for ignition. If Lara has the torch in her hand then she can ignite it if she stands close to a triggered flame (an object FLAME_EMITTER or a FLAME_EMITTER2), and holds the torch to that, using key Action (CTRL). But it won't work for other flames (for example, FLAME_EMITTER3). a, Lighting with it in the darkness. Just think about this situation: Lara doesn't have any flares so she has to find and ignite the torch to see in a pitch dark room. (Okay, she can also light a bit with the gunflash but what if she doesn't have any weapons? 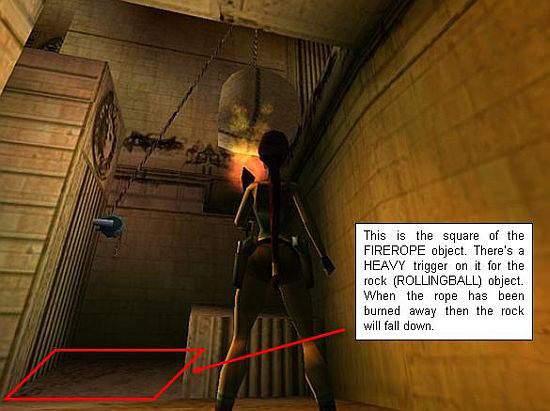 - See 'Lara (Weapons)' FLIPEFFECT triggers. b, Igniting flames with it. 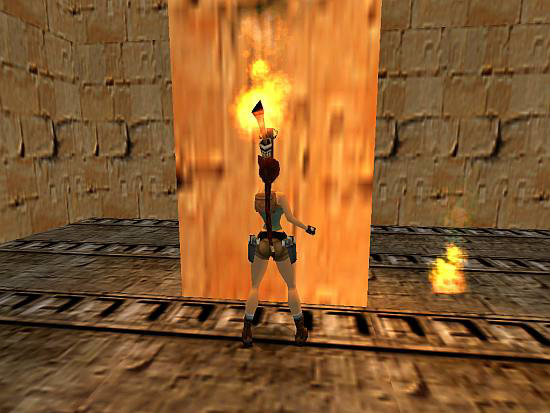 In these cases the rules are (mostly) the same just as at igniting the torch: if Lara has the flaming torch in her hand and she stands to a non-triggered flame (an object FLAME_EMITTER or a FLAME_EMITTER2), then she will ignite the flame object with the torch, if she holds the torch to the flame object, using key Action (CTRL). These flame objects must be within 0-4 (0-3,5) clicks vertical distance, but it doesn't matter if they don't have the default OCB window values. But you have to do one more thing to make this setup work: place one HEAVY trigger on the square of each of these flame objects. 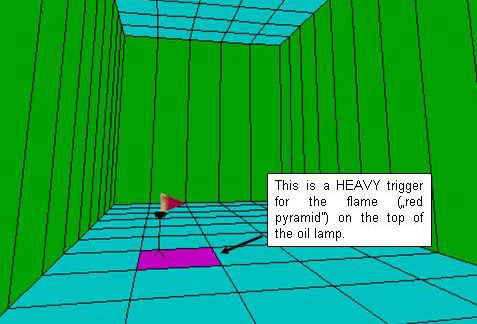 The subject of a HEAVY is the flame object on that square. d, You can use the torch for the burning floor. e, You can use the torch for the element puzzle. c, If it's not in Lara's hand then the torch will be put out automatically under the surface of water. These rules don't work about quicksand. In quicksand rooms the torch will work as on land. Lara can hold the flaming/non-flaming torch when jumping level. In this case she shows up in the new level with the torch in the hand. If it's problematic then place another torch item anywhere in this new level. - the last torch in her hand wasn't flaming in this level. b, The torch will be flaming just when Lara gets it if the last torch in her hand was flaming in this level. After a throwing like this Lara's next weapon-drawing must be with shortcut keys or from inventory. You can use the torch for some more purposes if you use conditions for the torch. You can use the constants in GlobalTrigger or MultEnvCondition script commands as conditions. This GlobalTrigger says if Lara has the flaming torch in her hand then TriggerGroup#1 will happen or else (i.e. if she has a non-flaming torch or other things in the hand or if her hands are empty) TriggerGroup#2 will happen. This MultEnvCondition defines a condition that is true if Lara has the non-flaming torch in her hand. a, in a CONDITION trigger: 'Multiple condition of <#>MultEnvCondition script command in (E)way'. 1. 'Lara. (Holds) Lara is holding/driving the <#>item' CONDITION trigger also has those any/fired/out torch conditions. 'Lara. (Animation) Lara is performing <#>animation': the condition is true if Lara's just performing an animation (marked in window #) of using the torch. This GlobalTrigger says if the condition in TriggerGroup#3 is true then TriggerGroup#4 will happen. This trigger gives data for the condition in TriggerGroup#3, i.e. puts the actual value of window E into Local Short Alfa1 variable. So if Lara's just throwing / dropping the torch then this trigger puts out the flame on the torch. 1. Just think about this situation: Lara picks the torch up at the starting point of the level, and she also ignites it there at a flame. Then she carries the torch to the end of the level where she ignites a flame with the torch before finishing the level. But, what if there's no other flame placed and ignited in the level and Lara throws/drops the torch in the middle of the level? If you used that 'flame-blowing' condition, then Lara picks the torch up again, goes back to the starting point, journeying half the level, and ignites that there again. - But it's a bad level editing, of course. 2. Maybe sometimes you can see flashing some kind of flame in the very foreground of the screen. One of reasons of this is the flaming torch thrown/dropped down - so, in a technical meaning (i.e. to disable this unwanted effect), it's a useful thing to put out the torch. The value 3 means 'Lara ignites the torch with the flame / the flame with the torch' (see above). But we also use a HOLD_OUT_TORCH condition this time, so TriggerGroup#6 will happen only if Lara's just igniting the (non-flaming) torch with a flame and won't if Lara's just igniting a flame with the (flaming) torch. Lara can't do some animations if she has the torch in the hand: crouching, catching a ledge etc. But, if we use that AnimCommand at an animation without that problem then Lara will overwrite the disallowance for the really engaged hands in that animation. It means, for example, she will be able to grab a ledge with a weapon in the hand. But Command3 (an original TR4 feature) won't work if we want that trick for the torch. 1. Just after that tricky animation you can find Lara with a lowered left hand. The torch in the lowered hand is useless, moreover, for example, you can draw weapon now and it means the torch will disappear in Lara's hand. You can solve the problem if you use 'Lara. (Mesh) Torch. <&>Give/Remove Torch to/from hand of Lara' trigger (see above) just after that tricky animation to raise Lara's hand again (i.e. to give her the torch back). 2. If the torch was flaming just before that animation then that FLIPEFFECT (or any other one) won't help, the flame will be put out when Lara starts the animation. a, ENV_FREE_HANDS constant for MultEnvCondition or Animation script commands, as a condition. b, FAN_SET_FREE_HANDS_TEMP constant for Animation script command, as an order.